If you are interested in adding pizzazz, that is liveliness, spirituality or peppiness, to your home, church or business, with a stained glass window or Tiffany Replica Lamp, you've come to the right place. My name is Whitney LeBlanc and I was introduced to the art of stained glass fabrication in 1960 while an Assistant Professor at Antioch College in Yellow Springs, Ohio. 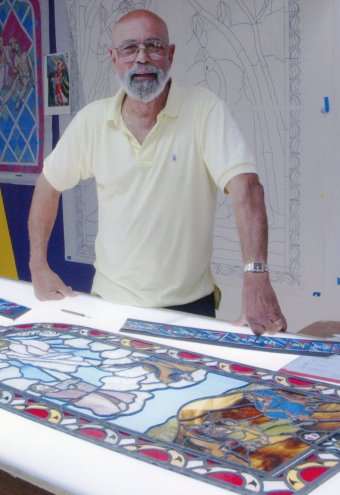 I was an apprentice to Robert Metcalf, a stained glass artiste of church windows, who became my mentor and friend. In a moment of divine inspiration I promised, "When I retire I am going to do stained glass windows." And so I did. After retiring from a career as a television director in Hollywood, I moved to the Napa Valley and opened a studio for designing Stained Glass Windows, Tiffany Lamps and writing books - all of which are presented here for your consideration.